There are four bases in a baseball game, three of them are known to be “first”, “second” and the “third” ones. The First base is the first one of the four existing bases that must be touched by a player on the batting team, so he scores a run. But it is important to take into consideration that the runner cannot be tagged out if he touches the base with any part of his body. The “first baseman” is known to be the defensive player, who is responsible for the area near the mentioned above first base. Usually to become a professional first baseman you should be tall enough as well as a slow runner as a tall first baseman presents a large target to which other fielders can throw, so his height gives him a larger range in catching as well as reaching the errant throws. The left-handed players are marginally preferable for first base, because it is easier for a left-handed thrower to make the throw to second base and because it is easier for a left-handed fielder to catch a so-called “pick-off” throw from the pitcher and tag the base runner. At the same time, a right-handed first baseman, when setting himself up in order to receive a throw from an infielder, must execute a half-pivot near the base, which is a special move, which a left-hander player should not make. The infield positions, which are second base, third base and a shortstop can only be occupied by the right-handed players, because of the time, which takes to pivot and so to set to throw. It usually takes a left-handed thrower more time to make the needed pivot as the time is always critical in this game. There are fewer positions a left-handed player can occupy, so the player has to be always fast enough. Second base is the second one of all of the four stations on a baseball field which has to be touched in succession by a base runner in order to score a run for this player's team. This base can be defended by the second baseman as well as by the shortstop. It is also known as the so-called “keystone sack”. A runner on this second base is meant to be in so-called "scoring position", reaching the home plate as well as scoring a run from the second base on the most base hits. If the runner is touching the base with any part of his body, then he cannot be tagged out. Usually if the second baseman as well as a shortstop possess quick hands and quick feet, then they have everything for releasing the ball with accuracy and speed. Both players must communicate well to be able to make a so known-to-be a “double play”. The second baseman is expected to have a particular agility in double play situations that usually force the player to throw first. At the same time his momentum can carry him in the opposite direction. Third base is number three on a list of all four bases, which a base runner must touch in order to score a run. Many batted balls may allow this runner to reach a home plate and so to score a run from this third base, but being on this base, the runner is valuable to the batting team, when less than two “outs” are recorded. If the runner is touching the base with any part of his body, then he cannot be tagged out. The third baseman is the defensive player: his responsibility is to defend the area nearest to the third base. Usually all “third basemen” have a very good as well as very quick reaction to the batted balls. They also are known to have the strong arms in order to make the long throws to the first base. The so-called “home plate” is the last of the bases that each player must touch in order to score. This plate looks like a five-sided slab of the whitened rubber, being set at ground level. The dimensions of this home plate are 43,2 centimetres across the front with a triangular rear of two sides of 30,5 centimetres and 21,6 centimetres down each side, having the rear edges at 45 degrees to the sides, making a point at the back. The home plate is coloured white and it is surrounded by a black strip of 1,9 centimetres in width, siting entirely in a so-called "fair" territory with the right and left field foul lines aligned with the two rear edges. Looking at the angle as well as the length of such home plate, it is obvious that this base is not in a shape of a regular pentagon as it is a 43,2 by 21,6 centimetres rectangle with an isosceles triangle of base of 43,2 centimetres as well as the equal sides of 30,5 centimetres each, being attached to the back. The “backstop” is so-called 15 to 30 meters zone behind the home plate, which is usually either a wall or a fence. This border is there for a reason of stopping the passed balls as well as the foul balls and, sometimes, the so-called “wild pitches”, which are the charged against a pitcher in cases when his pitches are too high, too wide or too short of home plate for the catcher to control, which may lead to allowing a baserunner to advance. 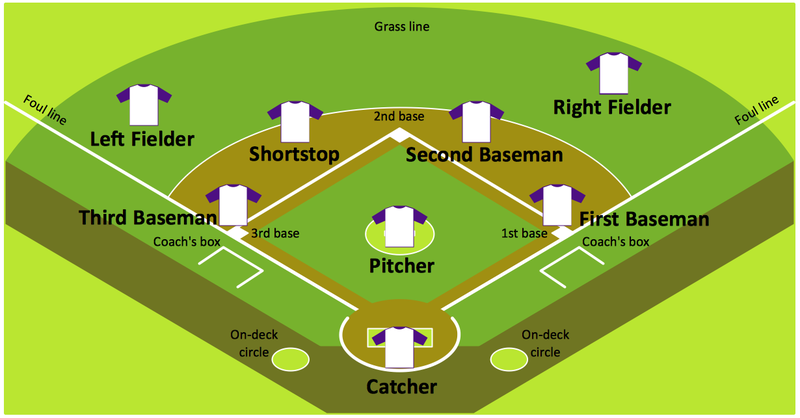 The mentioned, as well as many more other nuances of the game of baseball, can be found in more details on the Internet and once you decide to create your own baseball field plan, then there is the “Baseball Solution” available for all of the ConceptDraw DIAGRAM users, which can be found both on this site and in ConceptDraw STORE. 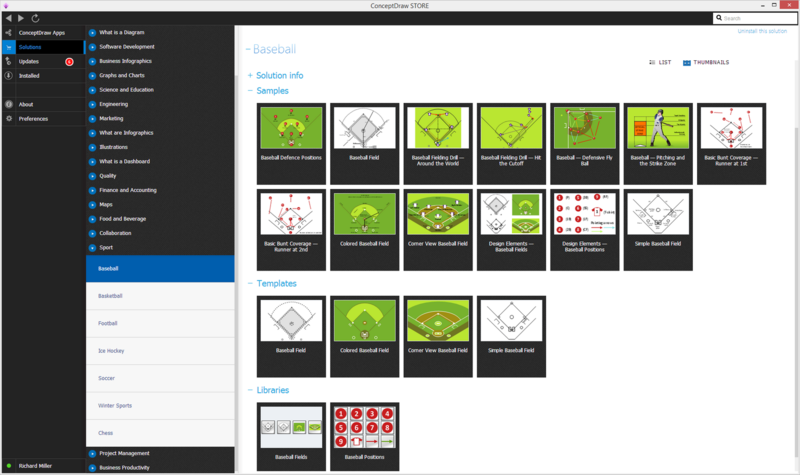 Having ConceptDraw DIAGRAM software as well as the ConceptDraw STORE application means having enough for creating the needed floor plan for the baseball field. The provided tools in the mentioned solution are the examples and templates of the previously created field plans which all can be used as a base for making your own great looking plans yourself. In case you need a software, that allows using the pre-made stencils as well as the samples, then ConceptDraw DIAGRAM is the best choice for this case. A combination of the "Baseball Fields" and "Baseball Positions" libraries gives you an opportunity to create the baseball-related drawings in only as few hours or even minutes, so it is always beneficial to have this application on your desktop as well as the needed solution for making different plans of the baseball field, including the corner view of the baseball field. This diagram was created in ConceptDraw DIAGRAM using the "Baseball Positions" library from the Baseball solution. An experienced user spent 20 minutes creating this sample.